The Caldecott Medal is awarded annually by the Association for Library Service to Children (a division of the American Library Association) for excellence in children’s book illustrating. 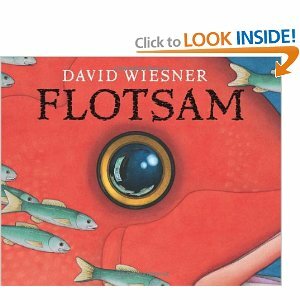 David Wiesner has won the Caldecott Medal three times, for FLOTSAM, TUESDAY, and THE THREE PIGS. In addition, his SECTOR 7 and FREE FALL are Caldecott Honor books. The awards are well-deserved, as his illustrations are magnificent. In FREE FALL (1988) we see a boy’s dreams as they morph from scene to scene, inspired by objects in his bedroom. The green plaid pattern of his blanket turns into a landscape of fields and then into a chess board. Trees shift into book pages and mountains turn into croissants. The most beautiful page has leaves changing into swans. TUESDAY (1991) shows the mysterious events of a certain Tuesday evening. (The front cover bears this disclaimer: “The events recorded here are verified by an undisclosed source to have happened somewhere, U.S.A., on Tuesday. All those in doubt are reminded that there is always another Tuesday.”) A bunch of bullfrogs are delighted when their lily pads suddenly levitate at sundown. The battalion of frogs on lily pads flies over the countryside to town, where the happy frogs surprise the townsfolk, annoy the dogs, and appropriate a sleeping old lady’s television remote control. SECTOR 7 (1999) follows a school class on a field trip to the Empire State Building. A curious cloud befriends one of the boys and takes him to see the Sector 7 Cloud Dispatch Center, where clouds receive assignments. The clouds are bored by their assigned puffy roundish shapes, so the boy draws new blueprints for them: lion fish, puffer fish, octopus and jellyfish. New Yorkers are delighted by the new fishy-shaped clouds. THE THREE PIGS (2001) re-imagines the classic “Three Little Pigs” story. 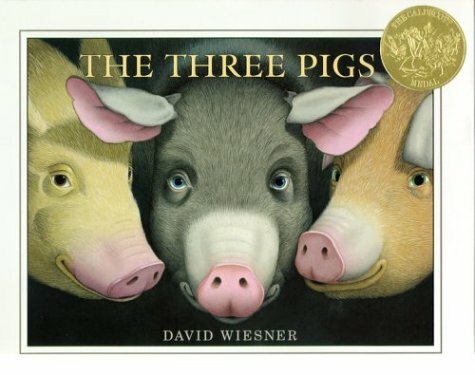 The clever pigs escape from the two-dimensional confines of their storybook and go exploring through the three-dimensional world. They pop into other stories, befriending the cat with his fiddle and a dragon guarding a golden rose. 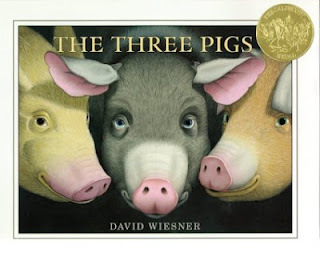 Eventually, they return with their new friends to the third pig’s brick house, where they all live happily ever after. My favorite is FLOTSAM (2006), which is simply extraordinary. A boy hunting for treasures on the beach finds a washed-up underwater camera. He has the film developed and is astonished by the resultant photos: a clockwork fish schooling with its biological cousins; bemused seahorses being photographed by miniscule green aliens; verdant islands clinging to the backs of giant starfish; and an octopus family relaxing on sunken couches. There are also photos of other children—the previous finders of the wondrous camera. The boy reloads the camera and returns it to the sea. The reader sees the camera floating through more magical scenes and eventually washing up on a distant beach into the hands of another child. 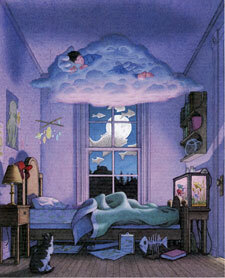 David Wiesner’s illustrations are intricately detailed and whimsical, appealing to adults as well as children. Because the stories are largely wordless, even very young kids can “read” them. I love the fantastical dreamy illustrations and would read these books for hose alone, but the stories sound intriguing too, even though my kids are beyond picture books and I don't read them much anymore. I do have young nieces and nephews and love to give books as gifts. Thanks for the great ideas. These all look amazing, Laura! The art work is so cool. No wonder he's a regular for the coldecott award. Thanks so much for this great review! If I remember correctly, my children's lit professor said that Tuesday is like Monty Python: people either love it or hate it. I love it. David Wiesner is brilliant. Free Fall is probably my favorite, but I love the format of The Three Pigs and the cloud expressions in Sector 7. And of course the grinning flying frogs in Tuesday. I love David Wiesner's books!! I'm a very visual person, so detailed pictures appeal to me, but the stories his pictures tell - almost completely without words - are even better! They're imaginative, funny, intriguing, and can be enjoyed by young and old alike! One of the things I like best is that each time we read them (because some books simply must be read as a family, regardless of the ages of those involved) we pick up little details we missed before. For instance: in Sector 7, we see the boy on the school bus reading a book about fish (which explains why he draws fish pictures for the clouds). Oh, these books are so much fun! I can never get enough!